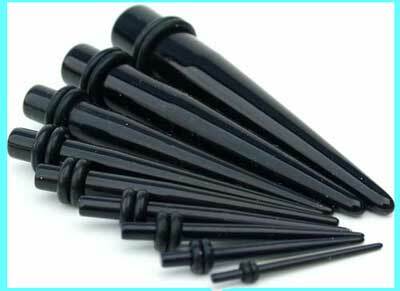 Black acrylic spikes from 1.6mm to 10mm (14 gauge to 00 gauge). This acrylic ear stretching kit will enable you to stretch your ear piercings from 1.6mm to 10mm. Set of 9 ear stretching spikes in black acrylic. Spikes are 1.6mm,2mm,2.4mm,3.2mm,4mm,5mm,6mm,8mm & 10mm (14g,12g,10g,8g,6g,4g,2g,0g,00g). If stretching your ear lobes, there is plenty fo different advice out there, but the main thing is to do it slowly and if it hurts then stop, anything from 2 weeks to 6 weeks is recommended between going up a size, to make sure you piercing is not stretched too quickly. The smaller sizes are relatively easy to stretch to, but as they go above 4/5mm, it will start getting harder, your skin will stretch, but it needs time to regenerate itself so as not to tear the tissue. We do stock a range of different ear tunnels and plugs to keep your ear lobe piercings open. The best eCommerce software by ShopFactory powers P9667. All-in one eCommerce and shopping cart software.